Four people were taken to hospital after a stolen vehicle collided with another vehicle in Scarborough’s Morningside area last night. Police said that a woman near McLevin Avenue and Sewells Road was standing beside her car as it warmed up at around 11:55 p.m. when a man shoved her out of the way and got inside. 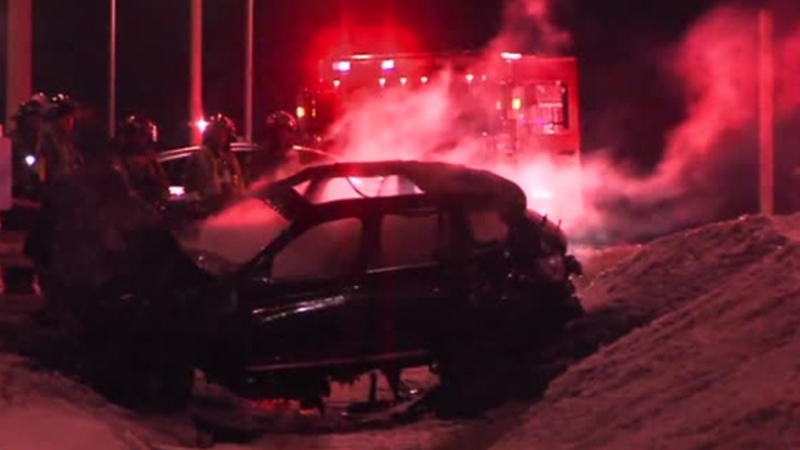 The vehicle was then involved in a collision a short drive away at Morningside Avenue near Highway 401. According to police, the 26-year-old driver of the stolen vehicle was ejected and the vehicle caught fire. Two court officers passing by noticed the burning vehicle and stopped to pull the driver away from the wreckage. The 26-year-old driver was taken into custody before being transported to hospital with serious injuries. Police said he is expected to face numerous charges in connection with the incident. Police said impairment is also being investigated as a possible factor in the collision. The two court officers and at least one person from the other vehicle were transported to hospital to be treated for minor injuries, police said. The wreckage of a stolen vehicle is pictured following a collision on Morningside Avenue near Highway 401 Sunday February 10, 2019.